Tracked down after a painstaking process in which police questioned dozens of owners of white BMW sports utility vehicles, Patricia Daniels surprised detectives with an unusual alibi for the time a mother was killed and her young son injured in a hit and run crash. Ortiz, the lead investigator in the case, said he wasn’t ready to rule Daniels out. To get to the hospital Daniels, who lived on Palisades Avenue, would have to drive right through the crash scene. And video showed Daniels walking into St. Vincent’s Medical Center at 7:18 a.m. The crash that killed Evelyn Agyei on Dec. 4, 2014 occurred at about 6:30 a.m. Waiting to be addressed on Monday, when the trial resumes, are the two 911 calls Daniels made minutes before the crash. In one she claimed to be surrounded by six black men at the corner of Coleman and Vine streets across town from the crash scene. Prosecutors Marc Durso and Adam Mattei claim the 44-year-old Daniels, a corrections officer at the Bridgeport Correctional center for 17 years, rammed Agyei’s car not once but twice as she sped down Boston Avenue killing Agyei and injuring her then 11-year-old son, Michael, before she fled the scene. She is charged with first-degree manslaughter, risk of injury to a child, evading responsibility in a death and misconduct with a motor vehicle. As the second day of trial opened before a 6-member Superior Court jury, Ortiz took the witness stand wearing the uniform of his new employer, the Stratford Police Department. After viewing the crash scene he said he went to Bridgeport Hospital to talk to Michael Agyei. “Michael insisted the vehicle that had struck his mom’s car was a white BMW SUV,” he said. Ortiz took the hazy photographs of the vehicle that caused the crash taken by city surveillance cameras to a local BMW dealership where he said the vehicle was identified as a newer BMW X-3. Since they couldn’t make out the license plate in the photos, they had to get lists of owners of such vehicles from the state Department of Motor Vehicles in Bridgeport and Stratford and these were issued to teams of detectives. Each team had to check each owner out. While there were several that had front-end damage, Ortiz testified that all were ruled out. Then on Dec. 16, 2014 Ortiz and Detective Aida Curet went to Daniels’ home about a block from the crash scene. There was no one home so Ortiz left his card. A few hours later Daniels called them and they went back to her home. A white, newer, BMW X-3 was parked in her driveway. “I noticed there was damage on the front end that was consistent with the accident,” Ortiz said. That included black paint on the front bumper that appeared to match the black paint of Agyei’s Subaru. With the jury out of the courtroom Daniels’ lawyer, Norman Pattis, told Judge John Kavanewsky Jr. that he needed latitude to pursue his two-prong defense. One, that it was not Daniels’ SUV that caused the crash. 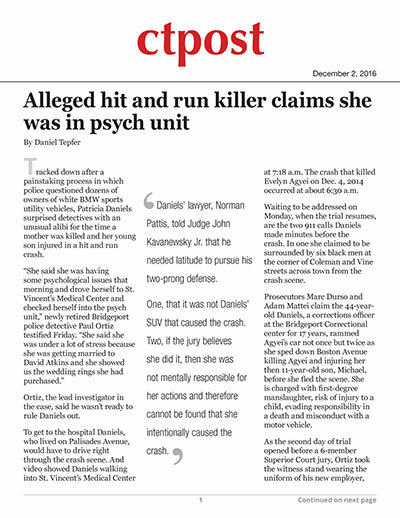 Two, if the jury believes she did it, then she was not mentally responsible for her actions and therefore cannot be found that she intentionally caused the crash. Then his cross examination began. “Miss Daniels voluntarily allowed you to take her car?” he asked Ortiz. “Yes, she did,” the officer replied. “Did she appear nervous?” he asked. “She told you she was very upset because she believed her granddaughter had been molested and she was so upset she couldn’t breathe?” Pattis asked. “And she told you she was upset with her relationship with David Atkins?” the lawyer asked. “She showed you paperwork that she had been treated for manic depression?” Pattis asked.